It wasn’t supposed to be this way. 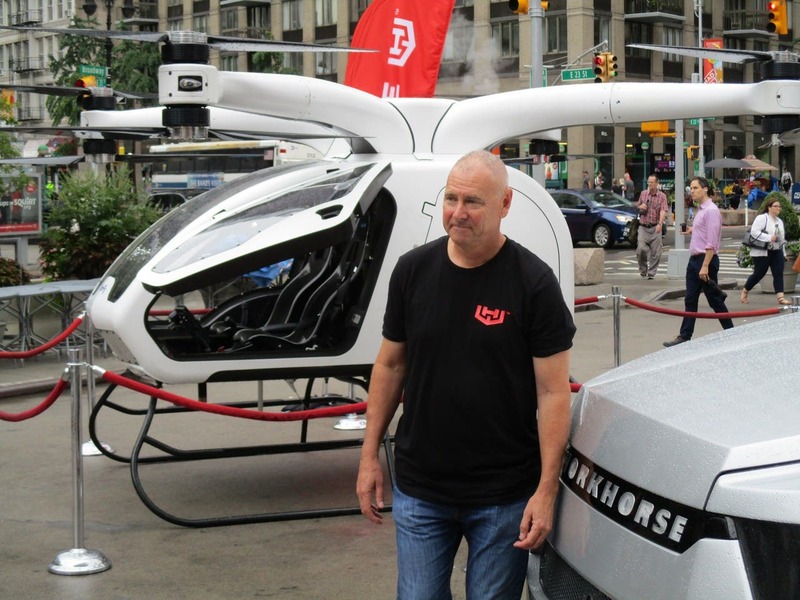 Workhorse spent months getting ready to bring its W-15 electric pickup truck and SureFly hybrid electric personal aircraft to New York City on August 13. It chose the popular space in front of the iconic Flat Iron Building at the intersection of Fifth Avenue, Broadway, and West 23rd street in midtown Manhattan for the reveal. Ideally, Manhattanites would come out in droves to learn about these innovative vehicles that are poised to reshape the future of transportation. When I stepped out of the subway station, I spotted the W-15 and the SureFly immediately. They were standing there in splendid isolation while anyone with a lick of sense was huddled under the pop up tent nearby. “Hmmm, good turnout for a rainy day,” I thought as I made my away across the street. It wasn’t until 20 minutes later when the monsoon-like conditions abated that I realized most of those people were just looking for shelter from the storm. That was okay because when the crowd thinned, Workhorse CEO Steve Burns had no one left to talk to other than me, so I got my chance to pepper him with what I hoped were intelligent questions. Burns, as it turns out, has some remarkable similarities to Elon Musk. He is a serial entrepreneur with a string of successful ventures in his resumé. He also shares Musk’s passion for showing people how to stop using fossil fuels to get from Point A to Point B. The difference is, Steve Burns is affable, approachable, and low key. Talking to him is like talking to your neighbor at a backyard barbecue rather than standing next to an internationally famous superstar. Burns loves talking about his company and I was all ears. We have covered the Workhorse W-15 in some detail in the past but to recap, it is expressly designed to meet the needs of utility companies. For them, the pickup truck is how they get the job done every day. Like the Chevy Volt, the W-15 is a battery electric vehicle. Plant a size 13 work boot firmly on the accelerator and the dual electric motors will move the truck smartly down the road using only electricity from the battery. The 3-cylinder range extender motor sourced from BMW is just there to replenish the battery when needed. The E GEN delivery van Workhorse builds for WB Mason and UPS uses the 2 cylinder range extender engine from the BMW i3 REx. The difference, Burns explains, is the W-15 needs to meet the demands of utility companies who may suddenly find they need to send crews to help with outages several states away. The delivery vans can pause to let the engine catch up during the work day if need be. The W-15 must be able to complete a journey of 500 miles or more — sometimes much more — without stopping. The carbon fiber body of the W-15 is low enough so workers can access the load bed without the need of a step ladder. Visibility over the lower than normal hood is excellent. The rear of the cab roof has built in emergency lights and there is a 110 volt power outlet workers can use to run power tools at remote job sites. This truck is built to work, not impress your friends at the country club, but that doesn’t mean its not a good looking set of wheels. Especially when viewed head on, it has a chunky, purposeful look that should delight any dedicated truck fan. In fact, the demand from private customers has been so great that Workhorse plans to open up the W-15 for sale to members of the public. Interested people can place a refundable deposit on one right now on the Workhorse website. But Burns says the company will fill the more than 6,000 orders from commercial customers first. Regular production is expected to begin in the first quarter of 2019, so there is a possibility sales to private customers could begin later next year. Base price for the W-15 is $52,000. Burns had a couple of tidbits he shared with me between TV interviews as the winds swirled and the rain pelted down. The W-15 is a body on ladder frame design. Initially, those frame rails were intended to be made from stainless steel but the company has decided to use extruded carbon fiber beams instead. As Burns explains, if Workhorse went looking for someone to design and build carbon fiber frame rails, it would have cost the company a ton of money. But Workhorse found a supplier that makes carbon fiber beams for the construction industry. Adapting them to serve as the foundation for the W-15 helped reduce the weight of the W-15 at minimal cost. So the W-15 will come with carbon fiber body work sitting atop carbon fiber frame rails. Are you kidding me? How long will these things last? Decades? More? Think of all the American made pickup trucks you see every day with rotted out doors and fenders. The W-15 may last long enough to serve the needs of an entire generation and still look as good as the day it was new. The other bit of good news from Steve Burns? An all electric version without a range extender engine will be available soon. The W-15 will be the first all electric all wheel drive pickup truck on the market. With its ability to carry up to 2,200 pounds of cargo and lug a 5,000 pound trailer as well, it should meet the needs of 95% of pickup truck owners. We live in a data driven world. 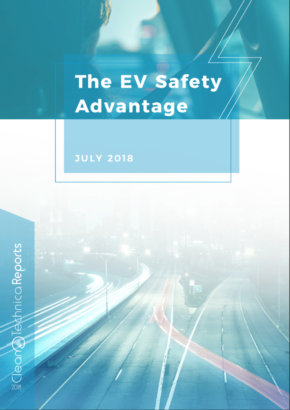 For fleet managers, knowing where vehicles are and how to employ them most efficiently means more profit in the bottom line. Workhorse has developed a proprietary cloud based monitoring system that gives managers all the information they need to know where each vehicle is in real time, how each component is performing, and what that best routing strategies are to maximize efficiency. The Metron telematics system was developed in house and is one of the most advanced monitoring platforms available today. 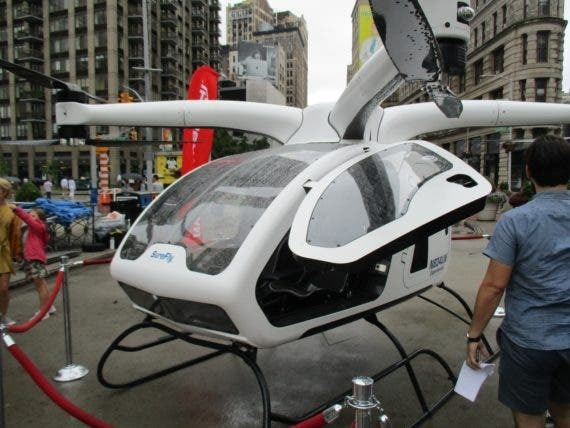 Talk to Steve Burns about the SureFly autonomous hybrid electric personal helicopter and watch his eyes light up. He is proud to say the SureFly is the first machine of its kind to begin type certification trials with the FAA. Even a person like Bill Gates with all his money couldn’t move the FAA process any faster than it is intended to go. First and foremost, the FAA is obsessed with safety. As it should be. Flying machines that fall out of the sky with humans aboard are bad for everyone. The SureFly is first and foremost an autonomous vehicle. Program in a destination and the onboard computer will take you there. The computer does all the flying. It adjusts the speed of each propeller to keep the craft flying level regardless of wind or weather. We have written extensively here at CleanTechnica about such personal aircraft and there are many of them, but the SureFly is further along on the road to FAA approval than any of them. Burns sees the SureFly as truly transformative transportation technology. Being in front of the pack is an obvious source of pride for him. In addition to the primary propulsion system, the SureFly has a backup lithium ion battery pack that can keep the craft aloft for 5 minutes. In an emergency, it can provide enough power to land the SureFly safely when and if it needs to land right now. In the world of aviation, triple redundancy is the norm, so the SureFly is also equipped with a ballistic parachute that can be deployed at any height above 100 feet. When the first electric personal helicopters fly in commercial service, Burns is certain they will be made by Workhorse. I am skittish about flying in tiny aircraft that have the word Experimental plastered all over their sides, but as my bus back from New York was slogging along Route 95 at 5 miles an hour while ensnared in a massive traffic jam that stretched from horizon to horizon, I began to understand the appeal of the SureFly. I would have been happy to fly above the clouds at 70 mph instead of being trapped in the gridlock below. If you live anywhere in the Northeast and want to go anywhere else in America, you pretty much have to go through New York City or detour around it. If you had a SureFly at your disposal, you would be freed from the strictures of the concrete and asphalt roadways below. The more I thought about it, crammed into a crowded bus and sitting opposite the rest room for 5 long hours, the more I began to realize that Burns and his merry band of engineers may be onto something here with their newfangled flying machine. 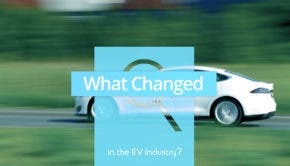 The EV revolution is happening and is gathering momentum every day thanks to the efforts of people like Steve Burns and his dedicated team of engineers and computer experts. 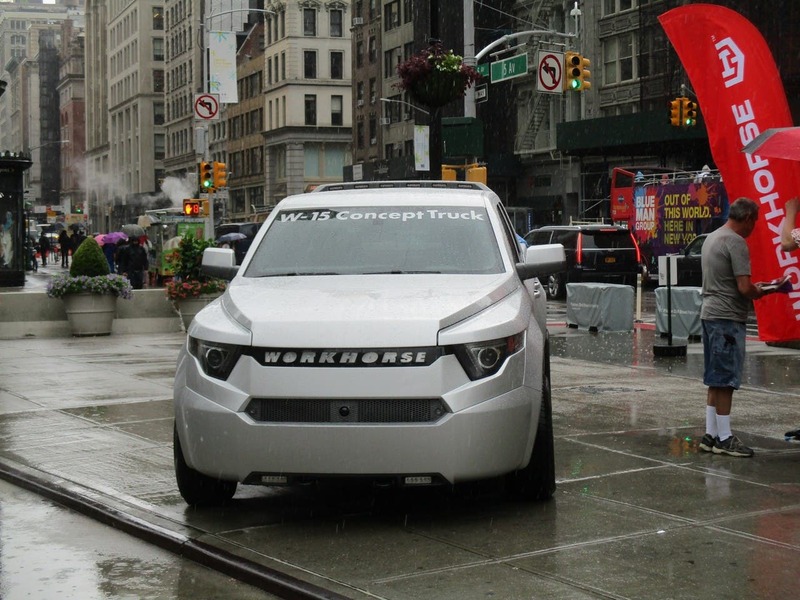 The reason for the Workhorse party in New York was to introduce the company’s new #WorkAhead branding designed to emphasis the company’s commitment to helping industry reduce the use of fossil fuels to get things done. Its E GEN hybrid electric delivery trucks are already being used by WB Mason and UPS. Its N GEN all electric van is the ideal delivery vehicle for the tens of thousands of companies who depend on Class 3 and Class 4 trucks to keep their business going every day. The SureFly is intended primarily to allow emergency medical workers to get where they are needed quickly and safely. I got a chance to drive the WB Mason E GEN van last year and am hoping to get some seat time in the W-15 and N GEN once they get into regular production at the Workhorse factory in Indiana. Can’t wait! Workhorse CEO Steve Burns braves the raindrops to talk about the W-15 pickup truck and SureFly octocopter. Photos by the author except where noted. The author owns shares in Workhorse.